"Room 33 in Pueblo Bonito is one of the most important archaeological discoveries in the entire southwest. It was excavated by George Pepper and Richard Wetherill as part of the Hyde Exploring Expedition work in the 1890s, and Pepper published an extensive account of the findings in 1909 as part of a Festschrift for his mentor Frederick Ward Putnam, who had originally sent Pepper to supervise the Hyde excavations since he was too busy to go himself. When Pepper published his field notes in 1920, he included only an abbreviated account of Room 33, since he had already published the fuller version. Unfortunately, while Pepper’s 1920 report has since been republished and is fairly easy to find, the Putnam Anniversary Volume is much less widely available, which makes the extremely important report on Room 33 much more obscure than it should be. In honor of the 100th anniversary of its publication, therefore, and the resulting fact that it has long since passed into the public domain, I present here a full transcription of the report along with photographs of the plates and figures. This will hopefully make the information contained in it accessible to both scholars and the interested public." Pueblo Bonito's first phase of construction began in the early 800s AD. This is the section in which Room 33 is and where some of the most beautiful flutes were found. Thousands of artifact were unearth from this room: thousands of turquoise beads, conch shell horns, etc.. Around 8 cottonwood flutes were found: two of those eight were complete flutes. 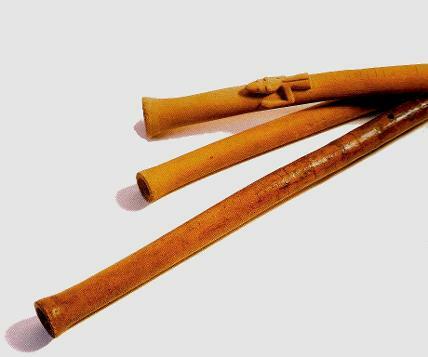 These were of the "self " type, as Pepper described them, or rim-blown flutes. 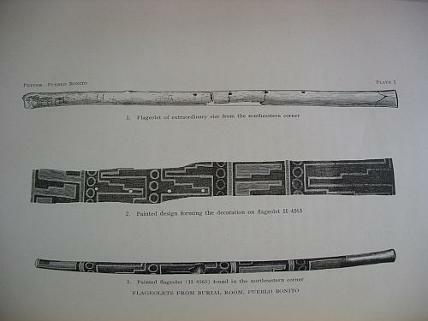 Specimen H-4563 (above) was the most elaborate of all flutes found in Pueblo Bonito. 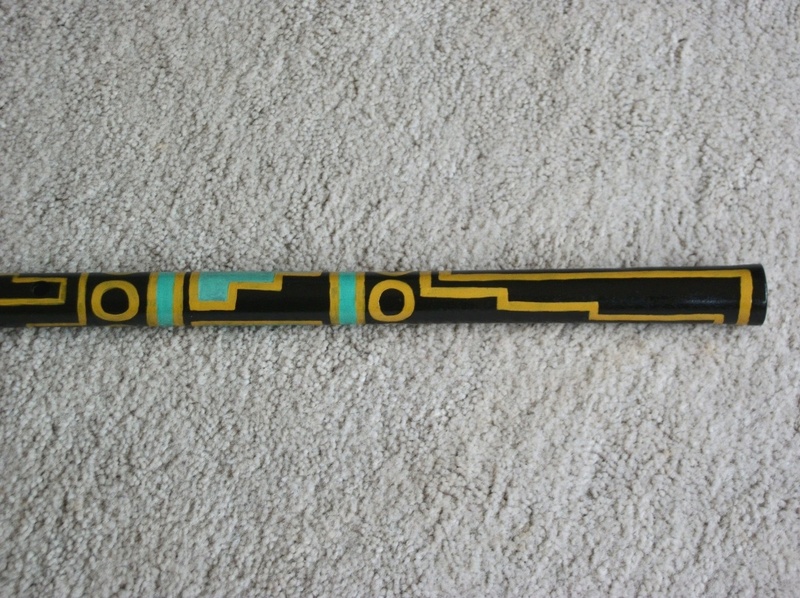 This flute was completely decorated with black, orange, and green paint. Then, a final topcoat of clear pine pitch was somehow applied. 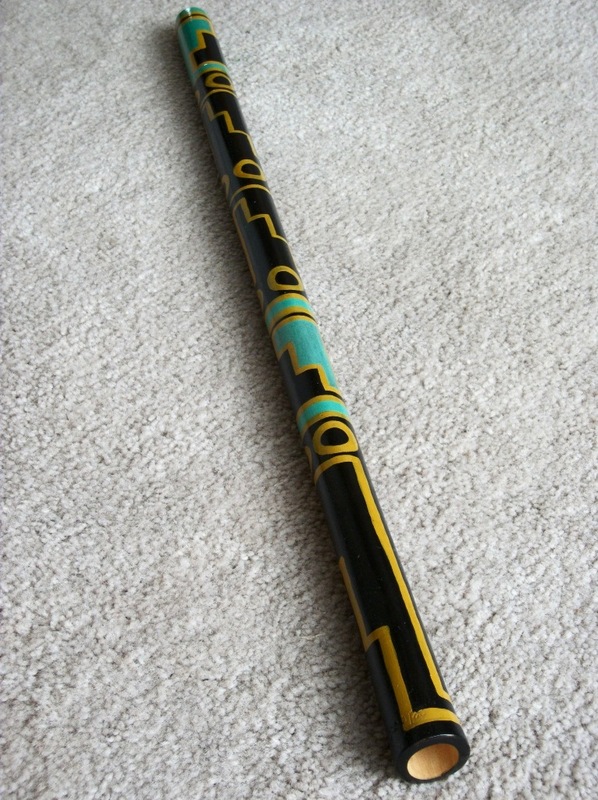 The length was 69 cm long, or around 27 inches with four holes. The other flutes were plain, nonetheless, but very beautiful. Several flutes also contained carved animals (image above). The lengths of these flutes ranged from 69 cm to 105 cm, or from 27 inches to 41 inches. 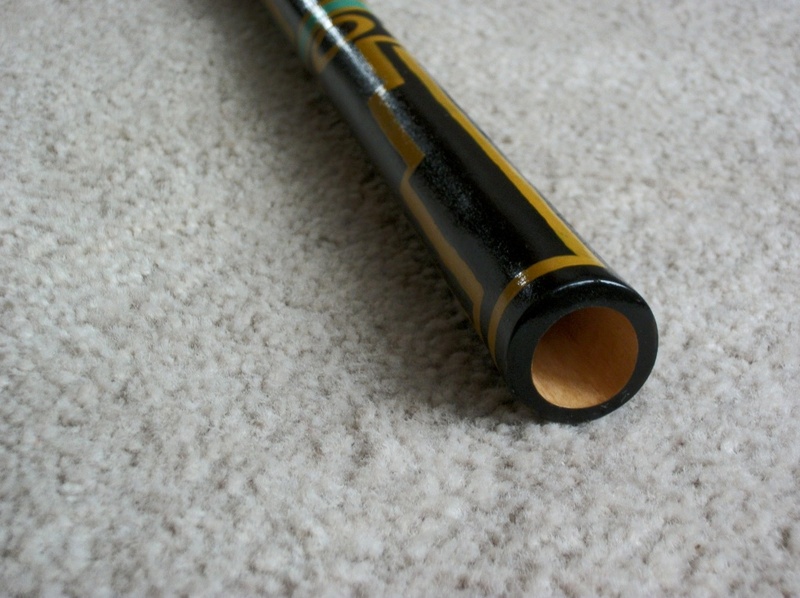 The longer lengths are estimates, because most of the flutes were not whole pieces. 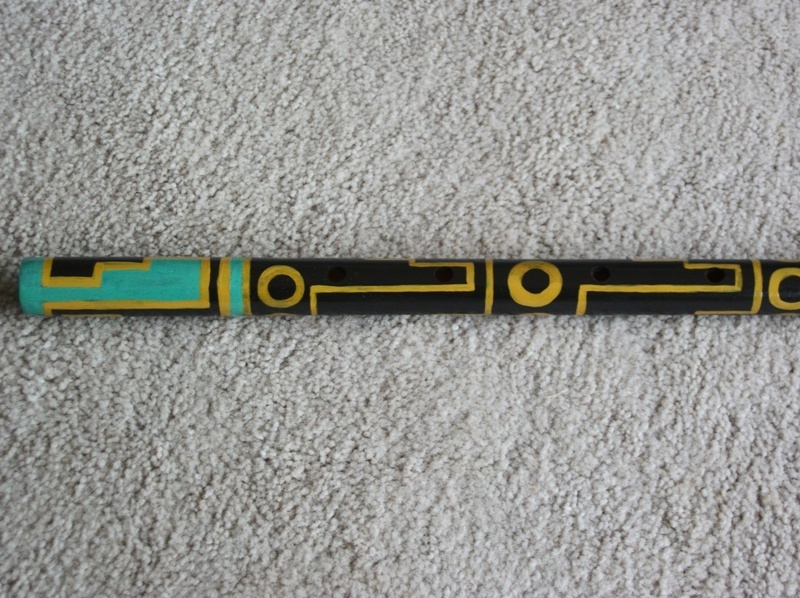 I make Reproductions of the painted flute (H-4563) with local wood and acrylic paints. They are representations of what I believe they should look like and are not exact copies. 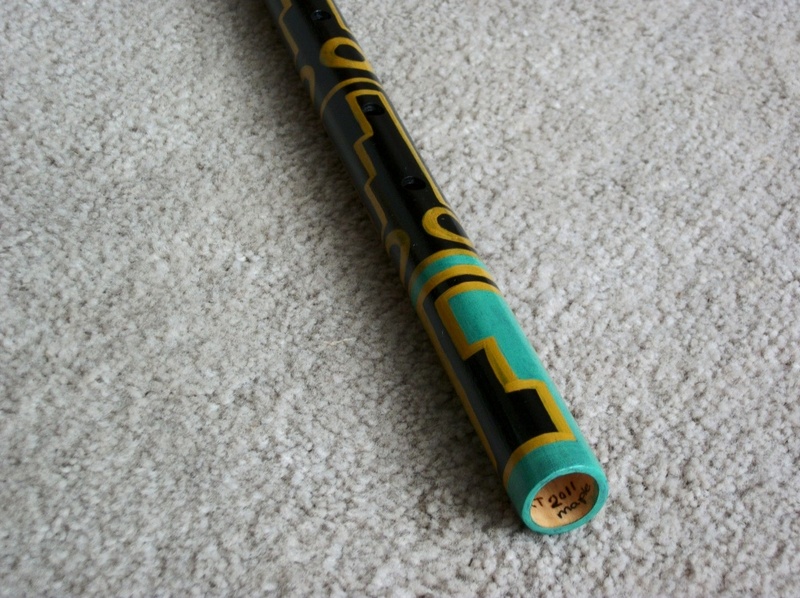 My goal is to make exact replicas using the same materials and measurements of the original flutes once I have figured out how the originals were made. On May 19, 2009, My daughter, My wife and I went on a trip to Chaco Culture National Historical Park to meet up with a friend of ours. 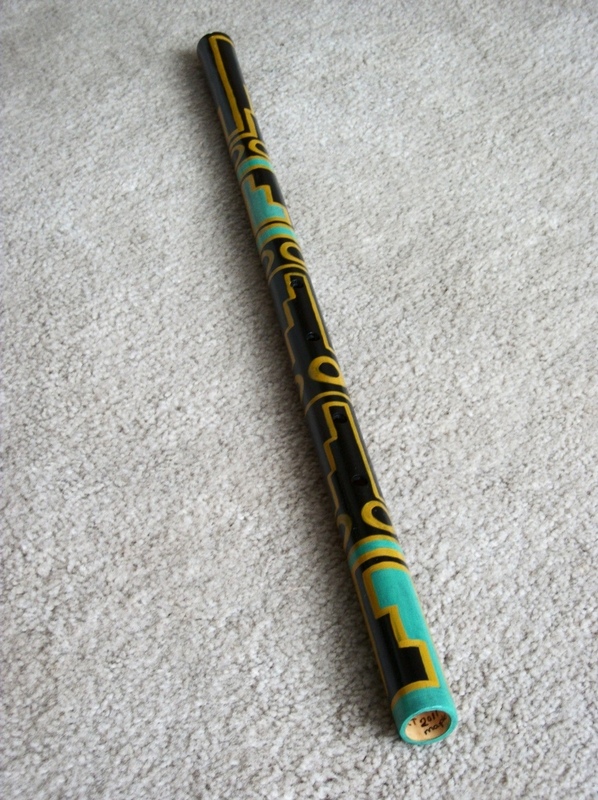 When we got there, we were surprised to find out that our friend, Kat had already mentioned me and the flute I had made for her and was bringing to her. 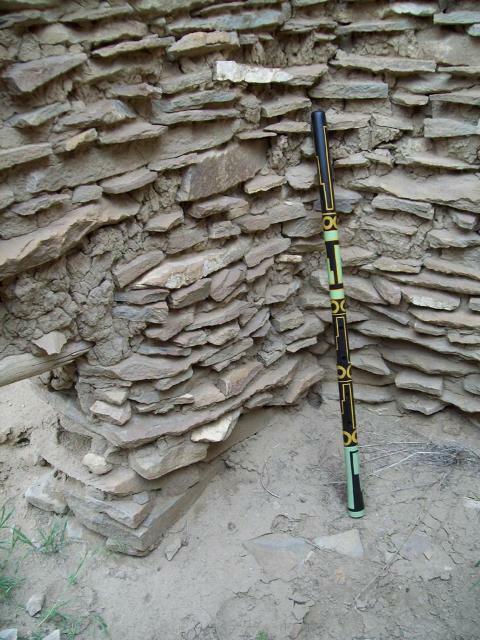 The flute was a replica of some flutes that were excavated from Room 33 in Pueblo Bonito. The Rangers on duty said they would be very interested in taking me to Room 33, and so we headed off on a unexpectedly cloudy day with virga clouds in the sky. One of the Rangers, gladly walked us through the ruins of Pueblo Bonito explaining to us the various architectual styles, building episodes, and stories of past visitors to the site. We slowly made our way towards Room 33. Room 33 wasn't a very special looking room at first glace. It is only about the size of a queen-sized bed. It dated to the earliest phase of construction (around 850 AD). Many artifacts were found in this room; from thousands of turquoise beads, shells, and even a conch shell horn. A few other artifacts led me here; Rim-blown flutes that were found in this room (33). 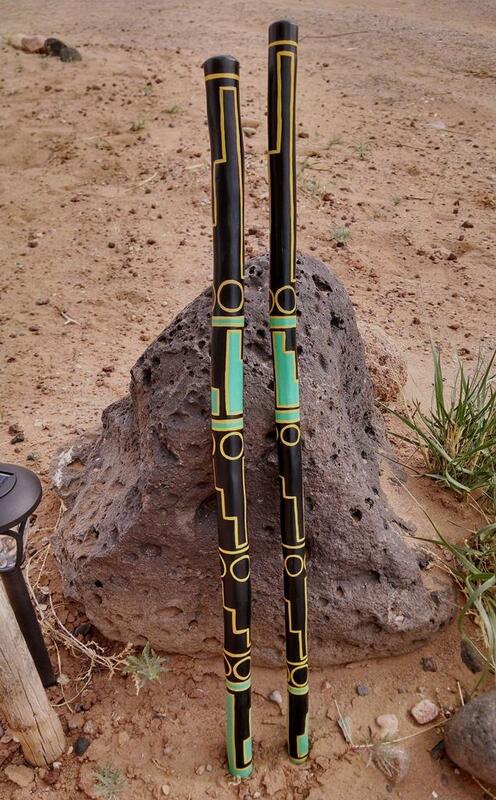 One of these flutes was a very beautifully painted flute that contained black, orange, and green, according to George H. Pepper's report from 1908, " The Exploration of a Burial-Room in Pueblo Bonito, New Mexico. " 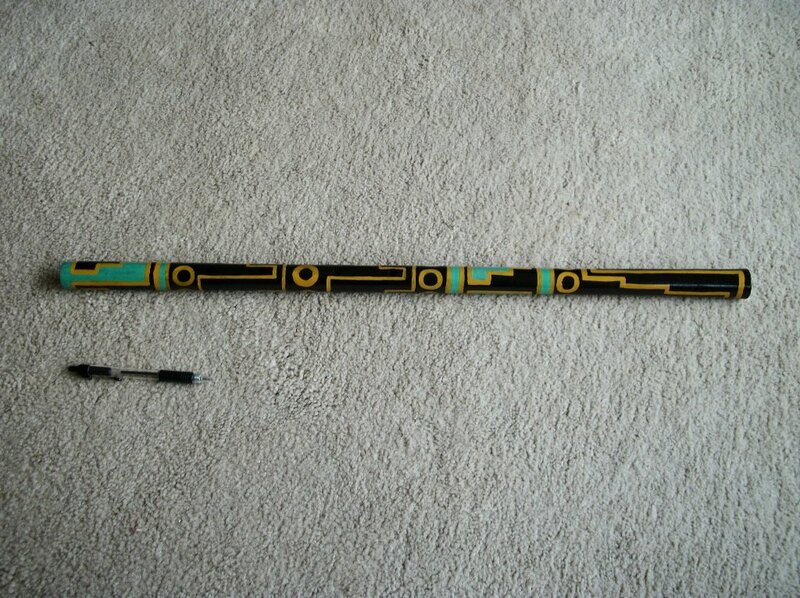 That painted flute is what I was aiming to recreate. Which I did, and the results were amazingly beautiful. I could feel the spiritual significance of why I was there as we neared Room 33. I was bringing something that was lost for centuries back to its origin. 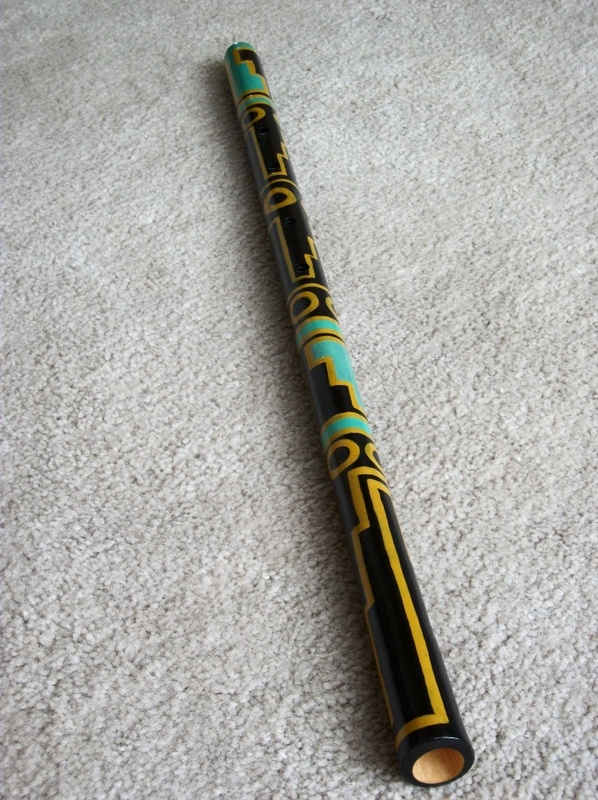 When we arrived at our destination, I put the flute to my chin, and I played whatever my heart wanted to. I felt so alive and at home. The winds began to pick up a little, and the Rain began. It was just a sprinkle, but I knew then and there that my ancestors were proud of what I had accomplished. I too was proud, because it was for them that I began making flutes. So, that their long cherished traditions would not be forgotten. I was so glad that I could share this with my family, especially my daughter. She will be the one I will teach everything that I know, and I hope she will be able carry on what I have taught her. I shall teach all who are interested as well, so that flutes are never forgotten. Watch a video made by Kat of this day. Two Reproductions made from Aspen and Cottonwood, painted with acrylics. 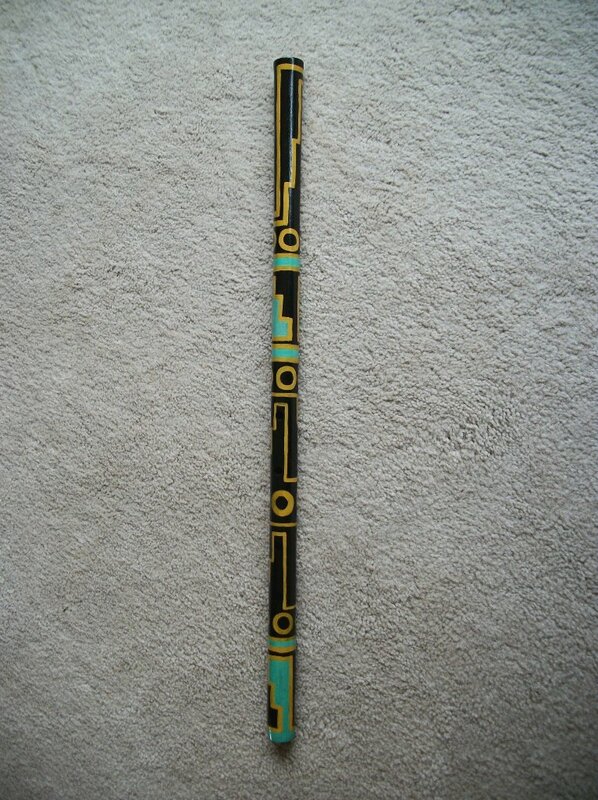 A Painted Room 33 flute that I made with Maple wood and acrylic paint.